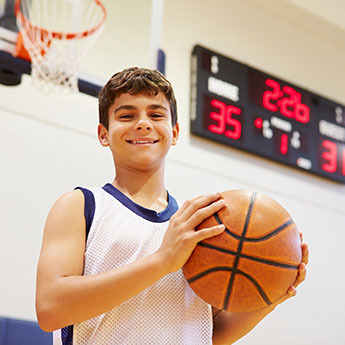 Protecting your smile while playing sports is essential when you have braces. Mouthguards help protect your teeth and gums from injury. If you participate in basketball, boxing, hockey, football, gymnastics, lacrosse, martial arts, racquetball, rugby, track and field, skateboarding, skiing and snowboarding, skydiving, soccer, surfing, volleyball, water polo, weightlifting, wrestling, it is recommended by the Canadian Association of Orthodontists that you wear a mouthguard. Choosing the right mouthguard is essential. There are three basic types of mouthguards: the pre-made mouthguard, the "boil-and-bite" fitted mouthguard, and a custom-made mouthguard from your dentist. When you chose a mouthguard, be sure to pick one that is tear-resistant, comfortable and well fitted for your mouth, easy to keep clean, does not prevent you from breathing properly and MOST IMPORTANTLY DESIGNED FOR USE WITH BRACES. Pre-made mouthguards FOR BRACES (Shock Doctor, Rebook or UnderArmor FOR BRACES) and "boil-and-bite" mouthguards can be purchased at most sporting good stores; If you decide to get a "boil-an-bite" make sure it has instructions for braces and follow them carefully. If you wear braces or a retainer, it is imperative for you to wear a mouthguard during contact sports. Your doctor can show you how to wear a mouthguard properly and how to choose the right mouthguard to protect your smile. Do not leave your mouthguard in the sun or in hot water as it may melt or become deformed. Replace your mouthguard at the beginning of every new sports season. You should also replace your mouthguard if you notice it has become worn and not longer fits properly. Do not wear a retainer with your mouthguard. If you wear braces, your doctor will help design a mouthguard to protect your teeth and your braces. Do not chew on, or cut pieces off, your mouthguard. Mouthguards come in different shapes and sizes, so ask your doctor which is best for you. Bring your mouthguard to each orthodontic checkup and your doctor can check to make sure it's still in good shape! Sports related injuries to the mouth and jaw are some of the most common injuries received by athletes. Our goal is to help minimize your chances of a sports related injury to your smile. Be sure to ask your doctor about mouthguards at your next appointment- GO TEAM!